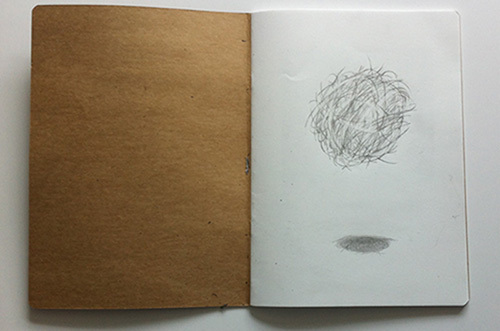 This essay concerns the importance of movement to ‘de-centering’ in the drawing process. It uses the language of theatre to describe how the rhythms of drawing movements enable artists to disrupt the drawing process, and achieve critical distance. It juxtaposes theory with practice, referring to drawings made since losing the sight in my right eye; this work led me to think about the interplay between looking and movement and the impact of changing viewpoints on action and reaction during drawing. My new monocular state requires an increased use of head movements as well as, for the purposes of the work cited here, magnifiers. This means that the environment is moving in and out of my field of vision as I move my head, and in and out of focus as I look through the magnifiers and then around them. I found that this multiplicity of views has correlates with the world of theatre, and I imagine the drawing room as a performance space in which the artist is actor/audience/critic. I suggest that in drawing, as in performance, disrupting the perceptual locus is a form of dissolving and resolving the relationships between self, other and object, and that this is manifested in metaphoric and literal acts of stepping back and forth from a work. That this puncturing takes place within a mimetic frame leads me to think of drawing in terms of a dynamical system rather than as I have previously discussed, a causal (action – reaction) or schematic (plan-do-review) process. I now see drawing movements as part of a constellation of neuro-somatic patterns and the drawn work as a fulcrum upon which the psychological and physical playfully seesaw. WILSON, Katrinka. Nests. TRACEY, [S.l. ], v. 11, n. 1, p. 1-7, nov. 2016. ISSN 1742-3570. Available at: <https://ojs.lboro.ac.uk/TRACEY/article/view/2420>. Date accessed: 19 apr. 2019.